Scatterometers and altimeters provide a variety of space-based observations that are useful for marine analysis and forecasting as well as other applications. 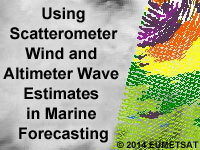 Key among the products are ocean surface winds from scatterometers and significant wave heights from altimeters. This lesson describes the basics of scatterometers and altimeters, including how they work, what they measure, and how scatterometer winds and altimeter significant wave heights are derived. It then discusses some of the challenges in using the estimates, such as dealing with ambiguities and rain contamination. The lesson also provides various opportunities to interpret the data, both in the main sections and the case studies. The time taken to complete the entire lesson was manageable. Particularly important was the part where one can download materials and study offline and take the quizzes later. Feel free to explore the course: there is a lot of precision in the interest of marine weather forecasting. I enjoyed this lesson. It took me about 4 hours, with a tea break, to complete but I was really taking my time. I enjoyed the flow of the lesson, there wasn't excessive time spent on the mechanics of scatterometers while at the same time a good introduction was given. The case studies were interesting. As an operational forecaster I found a few of the examples a little "obvious" and was looking for the trick question but that's on me, not the lesson. When you hear hooves, think horses not zebras as they say. I took the quiz directly at the end of the lesson without "revision" and the score reflects my breezing through it. I could do better. Overall I really enjoyed this afternoon. It's my first time completing an online lesson and I'll do it again soon. Short and to the point for an operational marine forecaster. Nice lesson, but I found it difficult in finding the question, answer section. If possible the section can be placed somewhere in the lesson. Moreover rather than segregating different questions according tothe contents, a single page for all the questions must be present,which will be relatively easier to scar through. I mean interacting withother users with double. The course explains the objectives in a logical order, provides references when it is needed and it is very enlightening. May be some introduction to certain comparison tools may be helpful. This course was very excellent, with well-made contents, easy access of the subject and easy to undersant with the illustrated images. It is of paramount importance to learn the various processes and procedures of how ocean remote sensing data and products that are made available on our visualization monitoring screens are generated and used in Forecasting in order to enhance our forecasting capabilities and information for the safety of life and property at sea and adjacent coastal areas. However, few more elements still needs to in cooperate. I strongly recommend this course to every marine forecaster. Thank you MetEd for this well thought out lesson. Thank you for helping me improve on my skills as a marine forecaster. Glory. This is a very useful lesson for the beginners of microwave remote sensing. It introduces the fundamentals of radar scatterometer and altimeter. It also shows the applications of scatterometer and altimeter data. 20-Aug-2015: fixed several typos in text and fixed number of 'correct' responses in one quiz question (no text was altered, only which responses should have been marked correct; two instead of one).